Whatever the benefits of using film, it does impose some very slight inconveniences, rather like eating proper bread. I can’t believe that anyone truly looks forward to making contact sheets, except as a refuge from a noisy household. Not everyone is blessed with a noisy household, but the contact sheet squats like a guard-dog between the wild and free joys of snapping and the urbane delights of the darkroom. What follows is not my own idea. The late Fred Picker is better known on the rebel side of the Atlantic. He sold photographic equipment and supplies under the trade name Zone VI. (ZONE V was already in use on Ansel Adams’ number plate.) He (Mr Picker) wrote a regular newsletter, passing on his wisdom and experience. He was a man of strong opinions and a competent photographer and printer. In person, he seems to have been an inspirational teacher. Much of what he wrote is interesting and useful, but I have consistently ignored his advice on how to pack a suitcase. One of his good and simple ideas was the Proper Proof. We all need contact sheets to see what our hard work looks like the right way round; it’s not really practical to judge facial expressions from a negative and small variations on a theme are easier to see as positives. We can scribble on a contact sheet with Chinagraph or Magic Marker with impunity or punch holes in it. In short, we need contact sheets. I used to dash them off, even snatching them from the developer when they looked about right, believing that if I could see them at all, then that was all I needed. So, what should we be expecting from our contact sheets? I suggest that we want to gather as much information as possible. Seeing that frame six is Auntie Jane and number seven is Brighton Pier is the minimum. With a bit of preparation, the contact sheet will reveal more and this is where the idea of the Proper Proof is so useful. Firstly, we want to see as much as we can in every frame. A whole roll of film (if we are using rolls of film) will inevitably have subjects of varying brightness and contrast and we shall see everything in the frames better if we choose a relatively low contrast or at least a normal grade of paper. 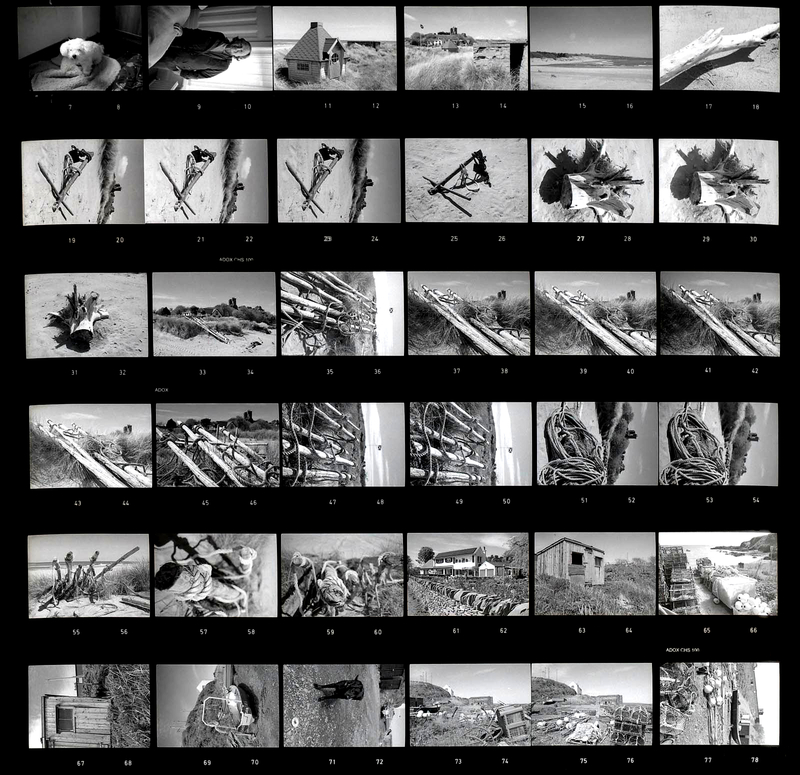 This may look dull, but contact sheets don’t need look exciting; they are intermediate tools. Excitement is for the gallery wall. I can see no reason why you shouldn’t use resin-coated paper for your contact sheets, but you are entitled to your own preferences. We shall get a much better idea of our exposure and development if we use a consistent exposure for every sheet. In this way, we shall track any little failings that might be creeping into the way we work and correct them before that once-in-a-lifetime masterpiece comes along. Set your enlarger head at the height you will use for making contact sheets. This will be a bit higher than for an ordinary 10x8 print to ensure decent, but not excessive coverage. Choose a height that you can easily repeat. If there are numbers on the column, choose a memorable one or make a convenient mark. Focus on the baseboard. Some timers can be erratic at short intervals so stop down a bit to avoid unusually short exposure times and give more even coverage. Stopping down won’t improve sharpness in a contact print, of course. Put a blank frame of film in the negative stage. If you haven’t got one, make a picture of the inside of your lens cap next time you’re out or simply remove the film before it’s quite finished. Next, make a test strip of the blank negative. As it’s had no exposure to light, it should logically print as totally black. Look for the first stripe on your test strip that is the same black as the next one along, which you won’t be able to see as a separate stripe. If you’re in doubt, make another strip at half the intervals of the first. As we are comparing blacks, make sure that these tests get adequate development in fresh developer. Adequate means using at least the entire time that the manufacturer suggests, with proper agitation, at the right temperature. We want to see the maximum black that this paper can produce. It doesn’t matter if it isn’t the blackest black in the whole wide world; this is not an exhibition print. Always remember that if the last stripe looks like the best one, you have no way of knowing if the next one might be even better, so you need to make another one with more exposure, to be sure. When you have a stripe that seems to have a suitable black near the middle of your test strip, wash and dry it. It may look different when it’s dry. Count the stripes and remember the number of clicks you used. This is the exposure that will make an empty shadow in your negative print as totally black, but shadows with slight exposure show as very dark grey, just as they would appear in a print. This is what you will use for all future contact sheets. This is your personal setup for a Proper Proof. If you use some special sort of film, with an unusual film base, you might want to repeat the test for each film you use. I’ve never felt impelled to do this, but I’ve been addicted to ordinary film and making life easier. Even an absolutely perfect contact sheet is only a contact sheet. Next time you are making contact sheets, re-set the enlarger to the height you used and remembered, stop down as before and give the same exposure on the same, preferably soft grade of paper. (Without the blank film in the enlarger, of course.) You will immediately be able to see what’s in each frame, including the highlights and shadows. You will be able to tell if you’ve been a bit optimistic when it got dark, or a bit cautious when it was bright or you could have given more or less development; you might discover that you take a lot of pictures of clouds or dustbins or cats and never print them, or that your horizons consistently tilt a little bit to the left; you might never take a vertical shot. In fact, you will have the whole biography of that roll of film laid out before you, in an easy-to-read form. If you’re happy with what you do now and it works well, keep doing it. Which grade do you suggest using for Ilford Multigrade paper? Do you stick with the same grade regardless of the density of your negs? Thanks. Thanks for the reminder of Fred Picker. Just now watched the DVD section on the negative. As he said, most will choose not to follow his suggestions on testing. But that's our loss. I was once told to print my contacts with grade 1 or even 0. However, now I normally set my Multigrade head to grade 2, since that would be the grade I'd normally start my teststrips at. Couldn't agree more. I've been proper proofing most of my stuff at grade 2 for a while. It can be disheartening, as it shows every flaw in technique. One thing to make the process less painful: if you use 9.5x12 paper and store your negatives in acetate sleeves, you can contact through the sleeve without removing the negs. I use a clip picture frame that I picked up in a charity shop to make the paper/negative sandwich.